This was a real unexpected find for us, but we are so thankful we stumbled upon it! It was a pretty typical Sunday morning for us. 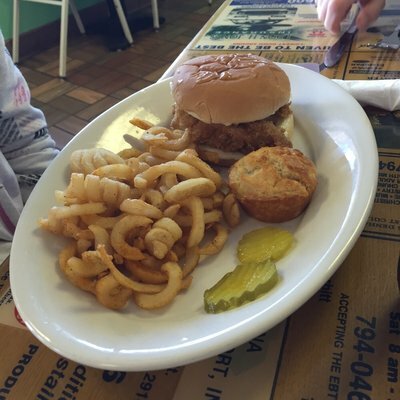 We go to an early church service in Lexington, so we are usually driving around town looking for something new and exciting for lunch, but are not really even that hungry yet. Sometimes we will hit Walmart or a grocery to kill time till “lunchtime”… but last week we decided instead to enjoy the pretty day and just drive. 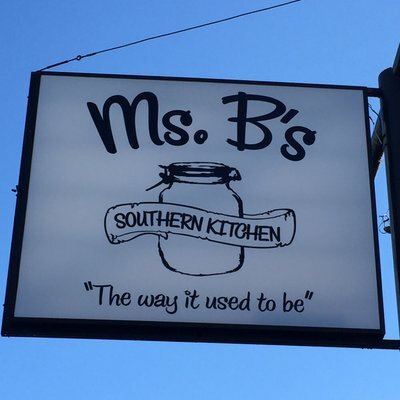 We drove from Lexington, down 378 all the way into West Columbia and were honestly headed toward downtown, hoping to find something to eat, when we passed by the sign for Ms. B’s Southern Kitchen. The building was nothing special and we probably would have passed right by it, except for the sign, which has an image of an old mason jar on it, that caught our eye. 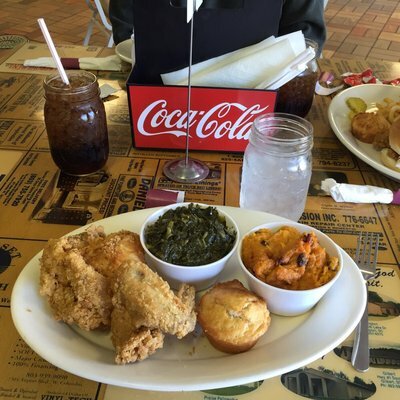 Then we saw the term “southern kitchen” and really became intrigued. 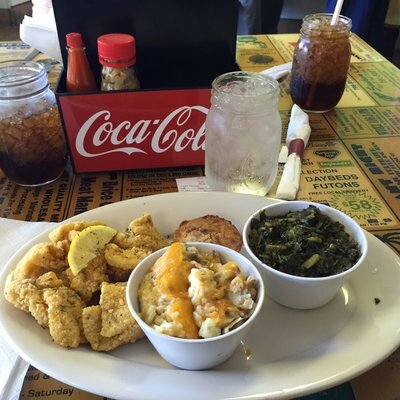 Being from Alabama, and living in the heart of Columbia, we LOVE real, honest-to-goodness southern food. There are a lot of restaurants around town that claim to be authentic but just serve meat and canned vegetables so they can call it southern, so we were skeptical. But then we saw the bottom of the sign where it said “the way it used to be”. My wife and I both grew up with down-home southern grandmothers (and aunts, and cousins, and friends) who knew their way around a kitchen so we know exactly what that phrase SHOULD mean, so we decided we at least had to try it out to see if they really meant it. First thing we noticed when we came in was that the place was HUGE! Like the outside of the building, there was not a lot about the decor inside that made you think this was going to be the best food ever. 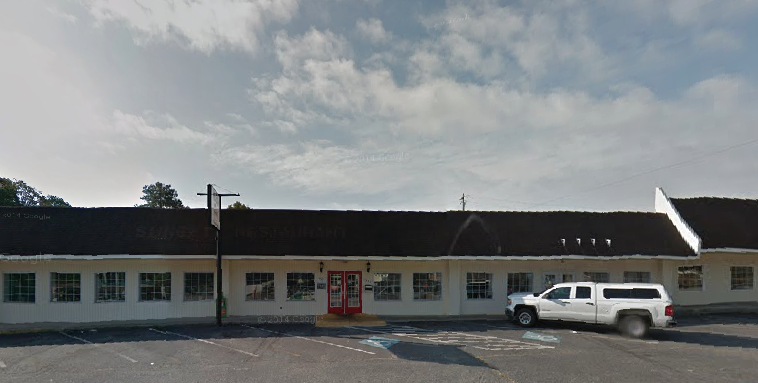 Several large dining rooms with lots of old tables and booths. (I say old tables, because the tables had ads printed directly on them. I sat down right where a large ad for a Pager company was printed… offering the latest in Motorola Pager technology and service!) It was fun though reading through the fun old ads while you ate, as well as enjoying their wonderful mix of 70s classics overhead. We got to introduce our kids to several new bands they were not familiar with in the process. like ABBA, The Commodores, and The Fortunes. When we arrived (before noon on Sunday morning) it was not crowded at all, so we were a little bit concerned that this could just be a cool sign, hung on an old, mediocre restaurant. We were immediately greeted by a friendly, energetic host who told us about the food, specials, how to order (large chalkboard menu behind the counter) if we wanted or how to get the buffet. We looked at the wall a while and checked out the buffet (which looked great) but being that we were still not that hungry, we decided to order off the wall/menu. We will definitely go back, and have already started telling our local friends about it. But we will do things differently next time. While it worked well for us to get meals off the menu (which you can see here: MENU) since we were not that hungry, next time we will for sure get the buffet. Normally we do not go in for the all-you-can-eat buffet concept, but there are so many different meats and veggies alone that we want to try from their menu that we need the buffet, simply so that we can try a little of everything. Plus, the buffet comes with a salad bar and desert bar as well if you do not commit like I will to fill up on the delectable southern cuisine! 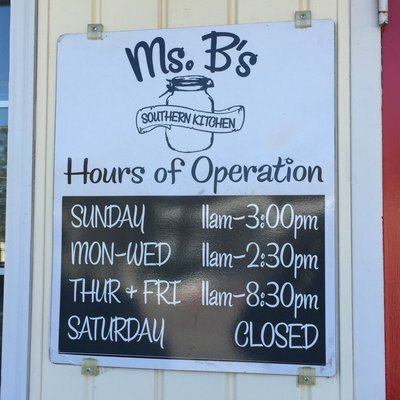 In a short conversation with the manager as we left, I found out that Ms. B’s has been there about 2 years, and is owned by the same folks who own Doc’s BBQ and also Pawley’s Front Porch, which is one of our FAVORITE local restaurants, so it was no surprise that the food was great! Oh, and a to the lack of a crowd in the huge restaurant when we arrived early on that Sunday morning… by the time we were done, the rooms were filled with hungry customers and the line was forming at the door to get in, with people who obviously had been there before and knew well what they would be getting! It is a little cheaper for lunch during the week than on Sunday or at dinner (which is only on Thursday and Friday nights) but worth it no matter when you come. But alas, they are closed on Saturday. And be sure to “Like” them (and find out more) on Facebook! 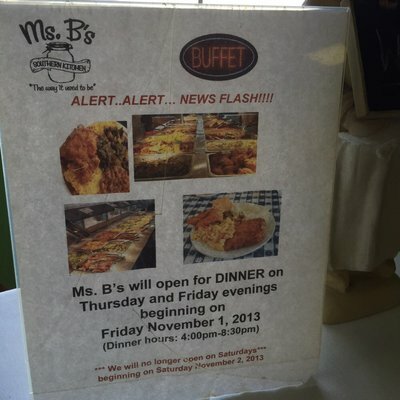 This entry was posted in picture, post, review and tagged buffet, carolina, catfish, collard greens, columbia, dining, dinner, eat, eating, family, fried chicken, lunch, meat and 3, Ms. B's, restaurant, south carolina, southern, Southern kitchen, vegetables, veggie plate, west columbia by Jeff Cruz. Bookmark the permalink.